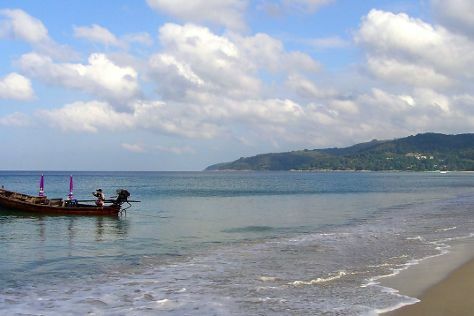 We've included these beaches for you: Ya Nui Beach and Kata Beach. Escape the urban bustle at Nai Harn Beach and Nai Thon Beach. Explore Phuket Town's surroundings by going to Karon Beach (in Karon) and Phuket Seashell Museum (in Rawai). There's lots more to do: take in the architecture and atmosphere at Holy Trinity Church in Phuket, take a tour by water with Asian Oasis - June Bahtra Cruise, and identify plant and animal life at Phuket Bird Park. To find reviews, other places to visit, photos, and other tourist information, read Phuket Town trip builder. The Route module shows you travel options from your home to Phuket Town. December in Phuket Town sees daily highs of 36°C and lows of 27°C at night. Wrap up your sightseeing on the 2nd (Mon) to allow time to travel back home.